I’m just a Midwest gal who ran away to San Francisco to escape the cows and cold winters. (Joking on that last part, but only kinda.) I had just graduated college that Spring and we both were desperate for a change. Mostly on a whim, we set our hearts on moving to The Bay and it was a choice that changed both our lives in ways we could have never imagined. On October 19, 2014, my now-husband Robin and I packed up our tiny red car at my father’s house outside Mount Horeb, Wisconsin and started our journey West. That road trip across America from Wisconsin to San Francisco was one of my favorite trips we have ever taken. This is the story of our road trip across America, the exact route we took, hotels we stayed at, the best American road trip sites we stopped at and general road trip tips to help you plan your trip across the country! 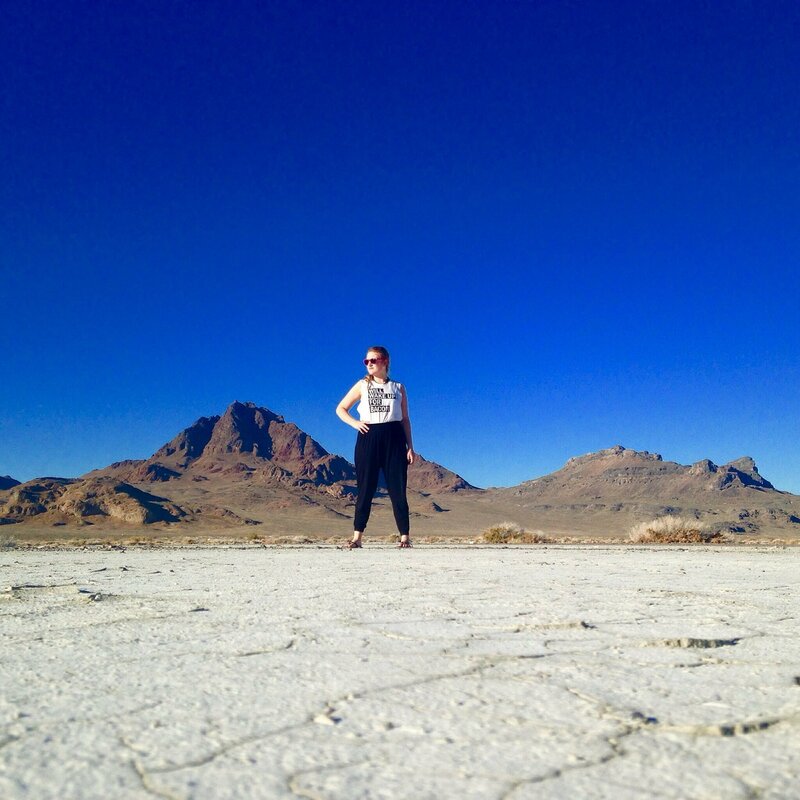 Psst – if you have any questions about the best road trip route or anything else, send me a DM on Instagram @thewhimsysoul and I’ll be happy to help! In the end, I knew the highlights would be the Badlands, Mount Rushmore National Park and Yellowstone National Park. 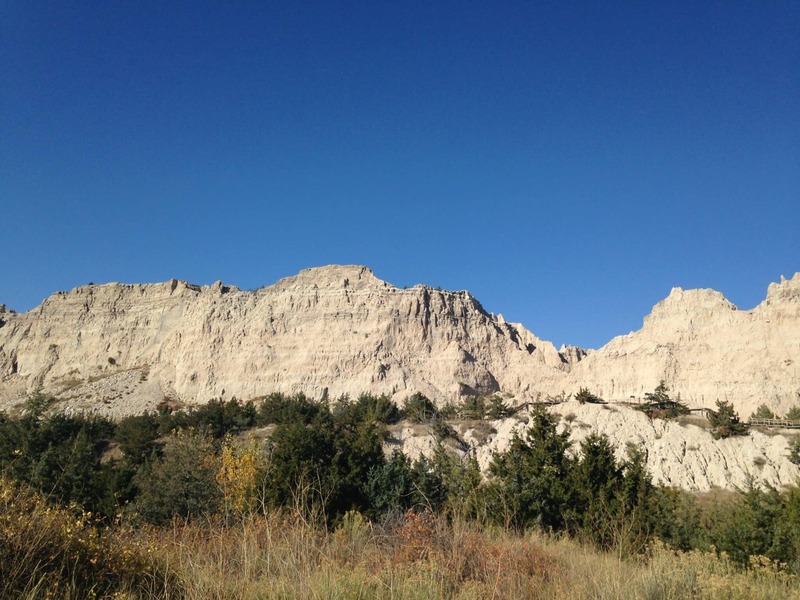 So I then built out our itinerary around those highlights and in the end we took 7 days for our road trip across America – one night in each city with the exception of two-nights in Rapid City so we could explore Mount Rushmore! At this point, neither of us had seen much or anything West of Minnesota, so we wanted to take a whole week to drive across the country. If you have the time, I highly recommend that you turn your road trip across America into something fun – don’t rush through it! I had a hard time fully visualizing just how big the United States is until we drove across it. Taking your time means you’ll see to see charming small towns, stunning natural scenes, National Parks, odd roadside attractions and everything in between. We drove through Wisconsin, Minnesota, South Dakota, Wyoming, Montana, Idaho, Utah, Nevada, ending in California. I relied on roadtrippers.com to map out our route and help me discover cool things to do/see along the way. If you are planning a road trip across US, you HAVE to check out this website/app. It’ll save you so much time. Below is the route we took! As you can see from the U.S. road map, we choose to drive through lower Minnesota on Route 90. To get there, we had to go North before going West and as you can see, we lost a little bit of time there. Route 90 is NOT the most direct route, but it made for one hell of a fun roadtrip. Let’s be honest, the middle of the country is a snooze fest. We choose to drive a little bit out of our way so we could have an interesting ride. I suggest you do the same for the perfect road trip! 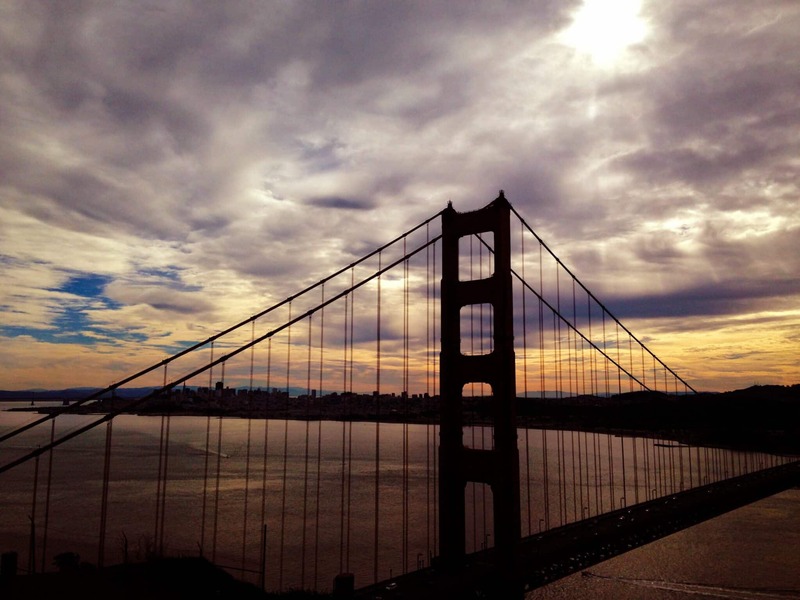 I have some friends who drove from the Midwest to San Francisco but took a lower, more direct route and they have nothing but bad things to say about their cross country road trip (spoiler alert- it was really boring and they hated it!) Our route contains a couple National Parks, oddball attractions, fields, mountains, forest and desert. We just had to stop at Jolly Green Giant statue! This huge, towering statue is off of 1-90 at 1126 Green Giant Ln, Blue Earth, MN 56013. Makes for a great Instagram photo! That day, we drove through Minnesota and into South Dakota, stopping in Sioux Falls, the major city on the East Side of the state along I-90. 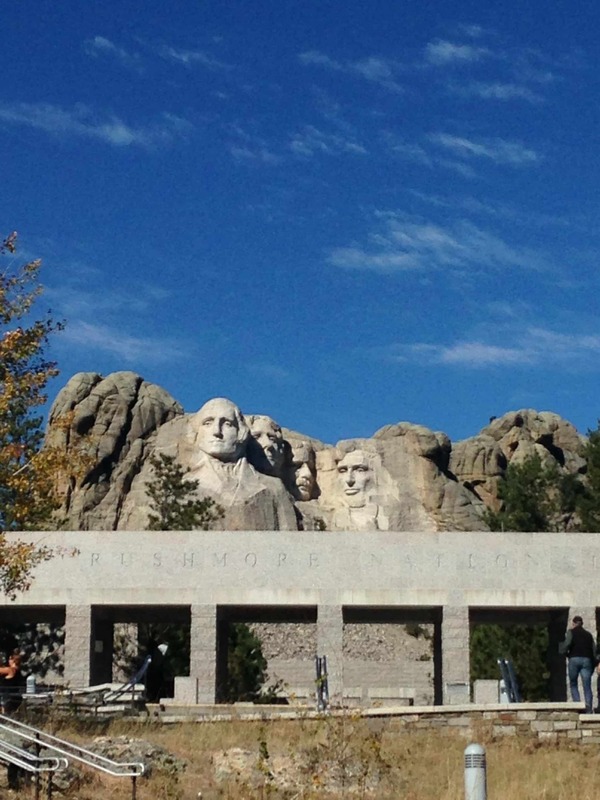 Our plan was to drive through all of South Dakota on day two, ending in Rapid City, home of Mount Rushmore. Sioux Falls is a pretty average Midwestern city. We stayed at the Red Roof Inn which was cheap (about $55 a night) and close to the highway. We did have to drive to a shopping center area for dinner. It was fine for one night at the start of a long trip. 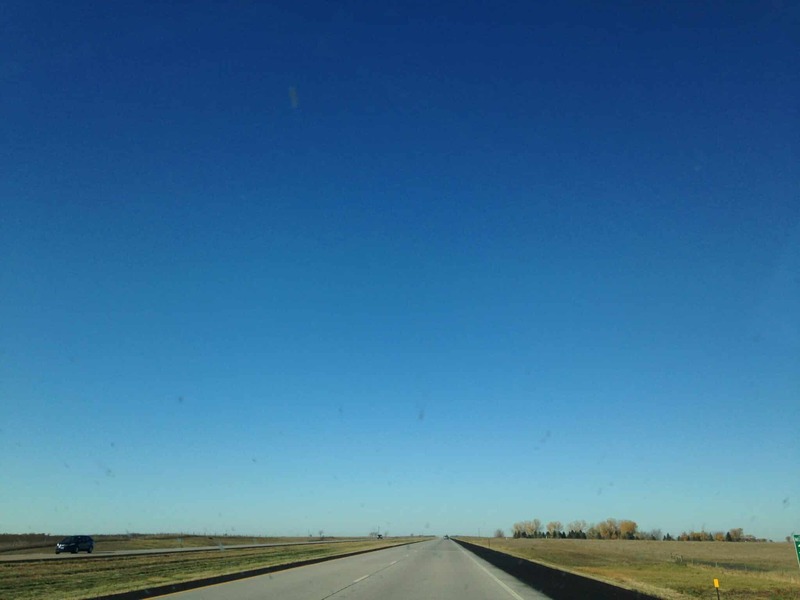 Guys, most of South Dakota is one of the most boring places I have ever been to. Sorry not sorry if you grew up there and are feeling butthurt right now, but it’s true. It’s so flat. So. Flat. It’s just flat, for miles and miles. There is a corn palace somewhere on I-90 that we stopped at and were incredibly disappointed to learn it’s not actually a palace made of corn. They just decorate the front of an old building with corn, so that was a big let down. At least it’s free. Still might make for a fun Instagram photo. 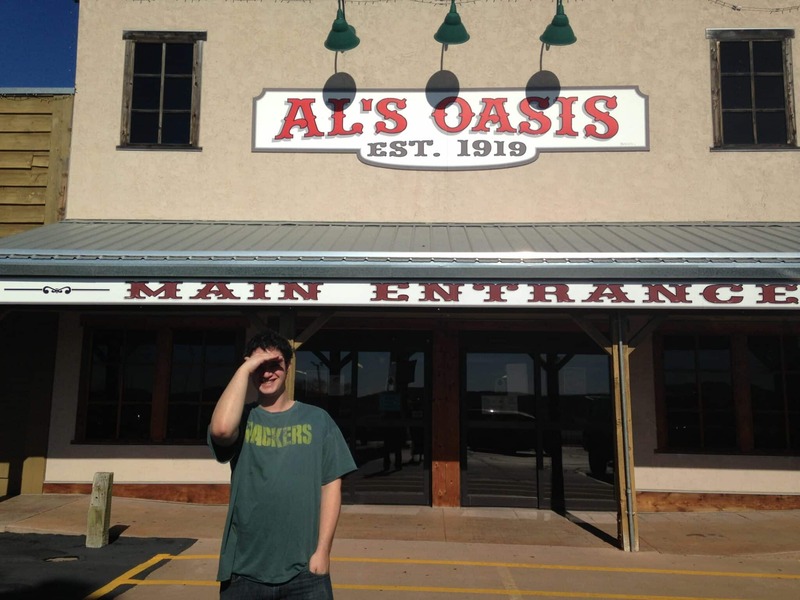 A few hours down the road is Al’s Oasis, a random pit stop in the middle of nowhere that has really great pie. But other than that, South Dakota (and I’m assuming North Dakota as well) is just flat AF. Look at this photo – you can see for miles! Psst – buy annual National Parks pass here so you can save money on your road trip across the US! You can also buy them at the gate of any park. Wall Drug is a famous roadside attraction that you probably have seen advertised on bumper stickers! You’ll also see ads literally for hundreds of miles in either direction of Wall Drug encouraging you to stop by. If you are driving from the East to the West across the state, Wall Drug is pretty much an oasis after hours of nothing. I loved Wall Drug. It was a fun (and yes touristy but still fun) stop after such a long day of driving. It’s like a little walled town in the middle of fields. They have lots of shops that sell everything from gemstones to Native American-inspired art to t-shirts. I found a stunning White Buffalo painting that is currently hanging in my hallway. They also have some restaurants and I *think* a bar. 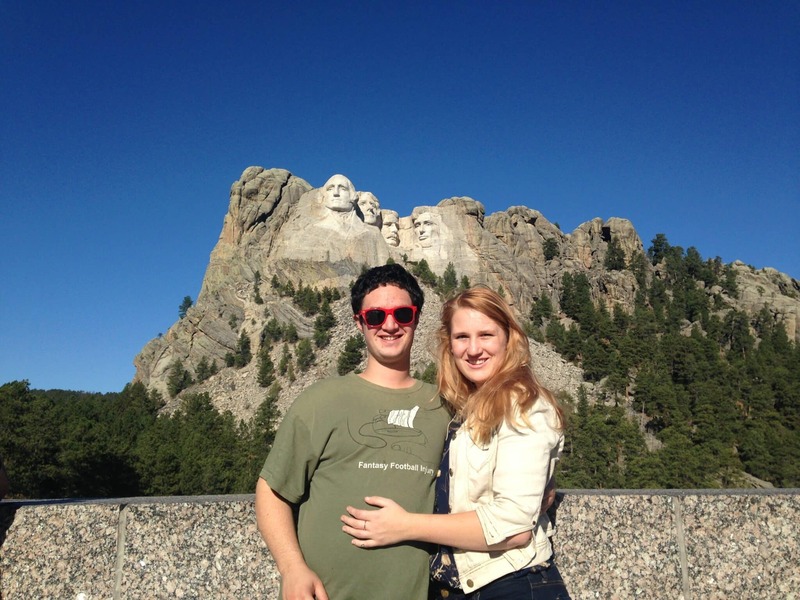 On Day three, we blocked off the whole day to explore Mount Rushmore and the Black Hills! We didn’t want to rush this national site. This National Monument has been on my bucket list for years! If you want to road trip the US and are heading anywhere near Mount Rushmore, set aside time to visit. I recommend showing up to the park right away in the morning. Try to be one of the first people there. This is for multiple reasons. First, the parking lot fills up FAST and it can be hard to find a spot. There isn’t exactly street parking in the hills, so if it’s full you have to come back later. Second, the Presidents look out towards the East. Pro tip: Visiting in the morning ensures a clear view of them and photos that are perfectly lit. There’s a really cute old mining-style town called Keystone close to the entrance of Mount Rushmore. Road trips are all about stopping at cool things along the way, so make sure to have lunch in this cute town on your way to the national historic site of Mount Rushmore! A bit down the road is a memorial called Crazy Horse. It’s the work-in-progress figure of Tasunke Witco (aka Crazy Horse) riding on a horse coming out of the mountain. More things carved in stone! it’s been in the works for years and isn’t even close to being complete. When we visited, just the head was done. We paid the entrance fee, but soon discovered that we couldn’t get much closer to the memorial – you can literally drive right up to the gate and see pretty much the same view as if you paid the hefty fee to enter. So, if you want to see Crazy Horse, skip the fee and look from beyond the gate. After the Black Hills, it was time to move on! This day was all about Wyoming! We had the goal of making into Cody that night. Cody is a small, cute town on the East side of Yellowstone National Park. If you look at a U.S road map, you can’t tell that the Northern part of Wyoming is much more rugged and interesting than the Southern part. As I mentioned above, friends of mine who drove through Middle America to get to California hated the drive through Wyoming. But our route through from Deadwood, SD through the Devil’s Tower, Bighorn National Forest and ending in Cody was perfectly dreamy. Wyoming was my favorite state that we drove through. I want to go back and spend some time on a ranch in Wyoming. I loved the mountains, the open sky, the twists of the roads, the cattle in the fields. An interstate map of the United States doesn’t tell you, but I will: take I-90 to I-14. Deadwood is a famous gambling mountain town. Picture Splash Mountain meets Las Vegas. We wanted to gamble in this famous town, so we picked a random casino! We rolled in and won $20 on our first slot machine. I have never, ever won anything about 30 cents on a slot machine since. Beginner’s luck? Regardless, it’s fun to swing by for 30-60 minutes on your way to Wyoming. Gambling probably isn’t featured in most road trip USA planners but It was a fun memory for us and maybe for you, too! 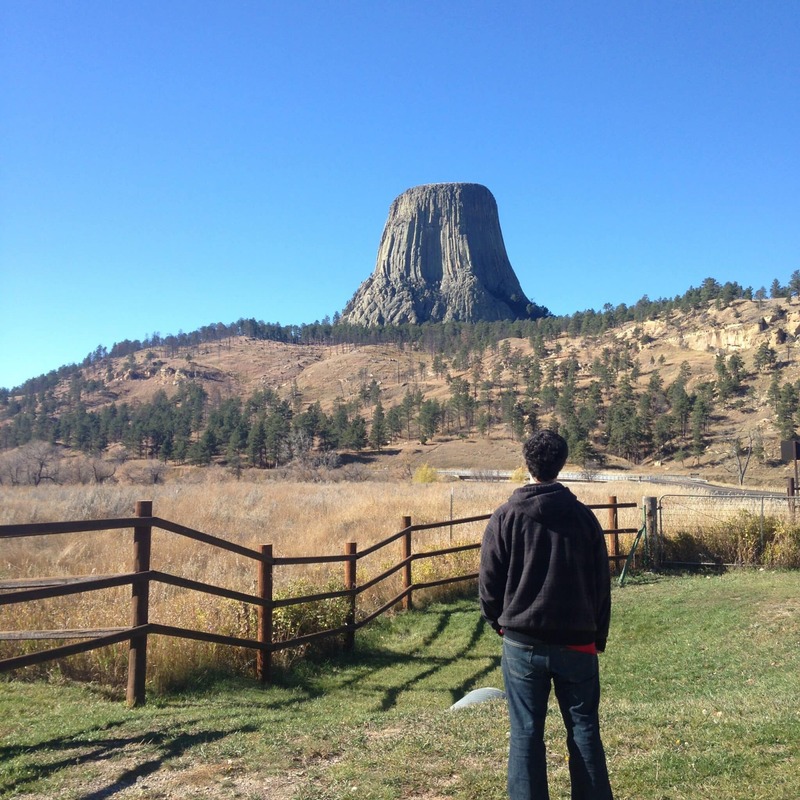 The Devil’s Tower is a laccolithic butte composed of igneous rock… in basic speak, it’s a really cool rock that looks like a post. 100% natural, baby. This spot has been on my bucket list for years and even though it’s about 45 minutes off I-90, we made sure to stop by. We didn’t have time to hike this (this time) so we just pull up to the main gate to get a close view. Not like it’s really needed – you can see the tower from miles away. America is huge and beautiful and full of hidden gems slightly off the beaten path. Make sure to see them. If you’re wondering how long does a road trip across America take – the answer is based on who’s driving. For us, it takes a while because there are so just so many beautiful things to see along the way. Another fun memory was driving up the steep mountainside of Bighorn National Forest. I felt like we were driving up and up and up for hours. It was a stunning drive. Tall trees and it felt like we were close enough to touch the sky. Then, we drove down the other side and “ohh” and “ahh” at every turn. We felt so small with the towering mountains and rocks above us. We stopped for a photo at a turnout, there’s many of them. The land on the west side of Bighorn National Forest is just what you picture a Wyoming or Montana ranch land to look like. Cute farmhouses next to cattle fields for miles and miles. Old trucks pittering past you on the highways. We drove this last leg of the day as the sun was dipping on the sunset and I fell in love. Cody is a small town on the Eastern side of Yellowstone National Park. Most people just pass on through or use it as a base while exploring the park. We stayed in a basic motel called the Wigwam Motel. There are some bars and restaurants in Cody, enough to keep you busy if you aren’t tired from driving! I remember watching the World Series at the restaurant that evening and Robin grumbling about how the Cubs never get there (fast forward a few years and they won the World Series! )That night, while watching TV in the morel, we discovered Cut Throat Kitchen on tv and our lives were forever changed. We’re total food network lovers now and it’s our tradition to watch cooking shows while traveling now. 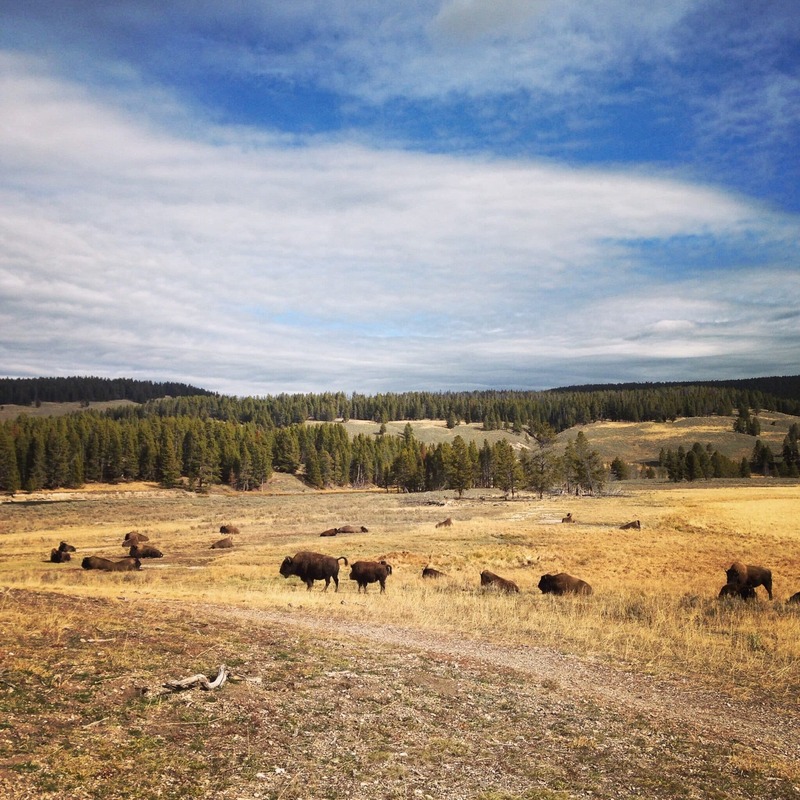 Old Faithful, bison wandering the roads, stunning mountains, wildlife galore – Yellowstone should be on everyone’s bucket list. The drive from Cody to the Yellowstone entrance is a stunning one in itself. You’ll pass a bright blue lake and weave among the base of mountains before getting to the National Park gates. Make sure to fill up on gas in Cody where it’s cheaper! There aren’t many options to fuel up in the park. This park is HUGE so we gave yourself the whole day to drive around it and explore. We didn’t want to rush and we also knew that sometimes parks have delays (limited roads, wildlife, etc) so we didn’t want to be held up and late. The park closes most of its roads during the winter. We visited about 1 week before most of the roads were due to shut down. If you are taking a road trip across America and plan on stopping by Yellowstone, check to see if roads are open! 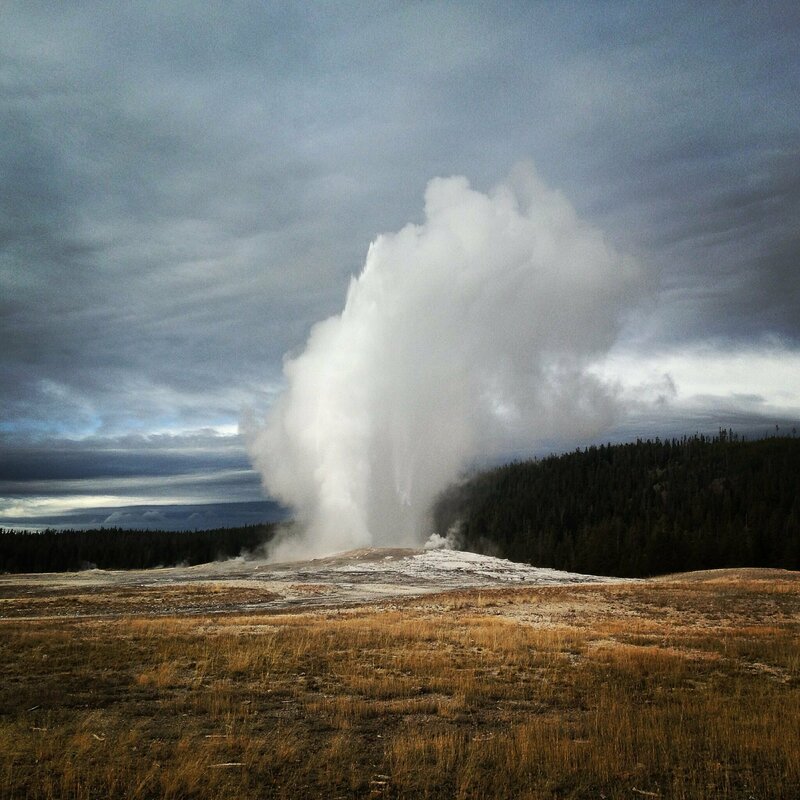 Old Faithful is obviously a must-stop when visiting Yellowstone. If you packed lunch into the park, this is a great stop and picnic while waiting for the geyser to blow. The Caldera is also a must-stop. It’s an out-of-this-world looking crater that’s the top of a supervolcano that frighteningly still active. 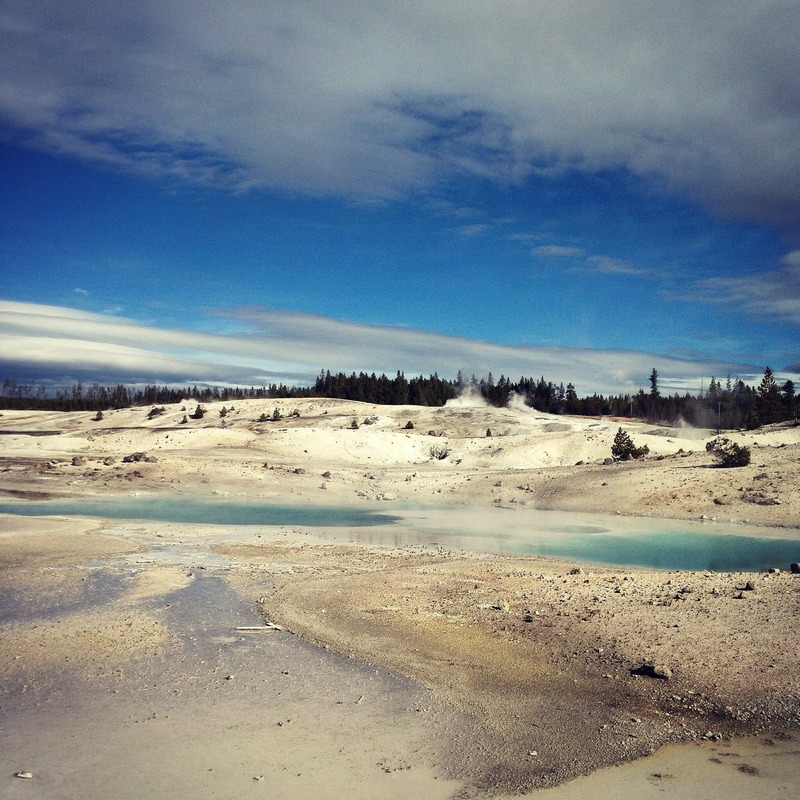 Norris Geyser Basin was my favorite spot. You can walk out onto the geothermal bed on wooden walkways. The air smells of sulfur but it’s such a cool experience. Remember that wild animal in the park are WILD! Don’t be an idiot by trying to take a selfie with a bison. He may hurt you. You may hurt the bison. If you have more than one day, you should do some hiking or even explore Grand Teton National Park, which is just South of Yellowstone. We spent the night in West Yellowstone, a town even smaller than Cody. Its name says it all – it’s directly West of Yellowstone! And, in Montana! (Like the corner of the state, but it still counts!!) I remember having the best pancake breakfast of my life in a little cafe in West Yellowstone. This large lodge was the nicest hotel we stayed in during our road trip. It was right downtown and in easy access to restaurants and bars. West Yellowstone is much closer to the entrance of the park than Cody is, making it my first choice of town to have as a home base when exploring the park. If you choose to spend more time around Yellowstone during your road trip, I would suggest staying in West Yellowstone and at the lodge! We left Montana and quickly crossed into Idaho. I want to come back to Montana and visit Glacier National Park. You really do see potato trucks everywhere! 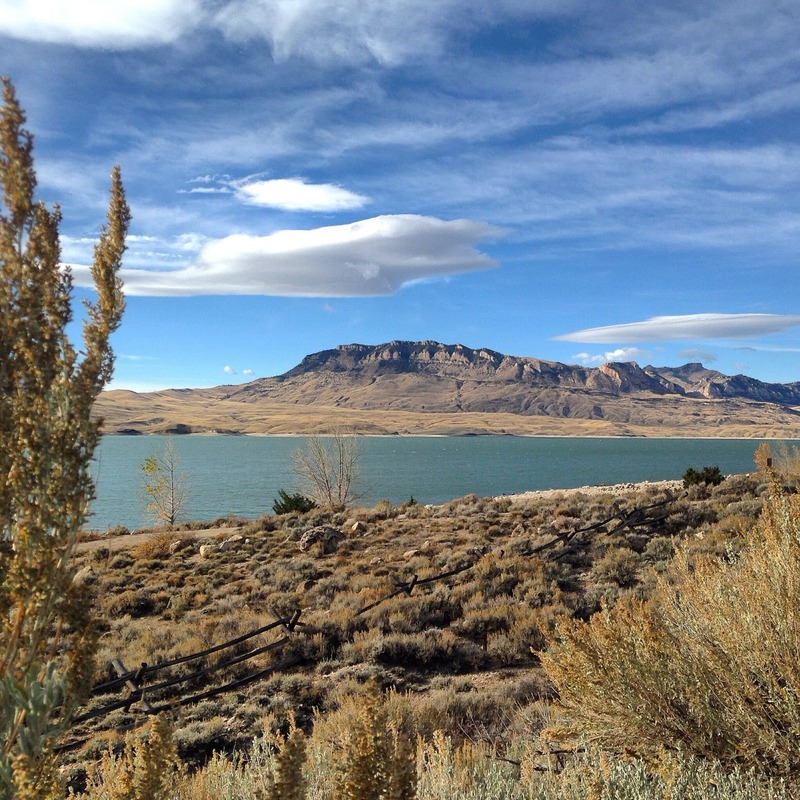 I remember being taken aback by Idaho – it’s not as flat and boring as I thought it would be! The parts near Southwest are beautiful as you can see mountain ranges in the distance. We didn’t stop anywhere in Idaho, which is why it’s on my bucket list to come back one summer and spend a week on a ranch soaking up all the beauty of the state. There are SO many National Parks in Idaho! 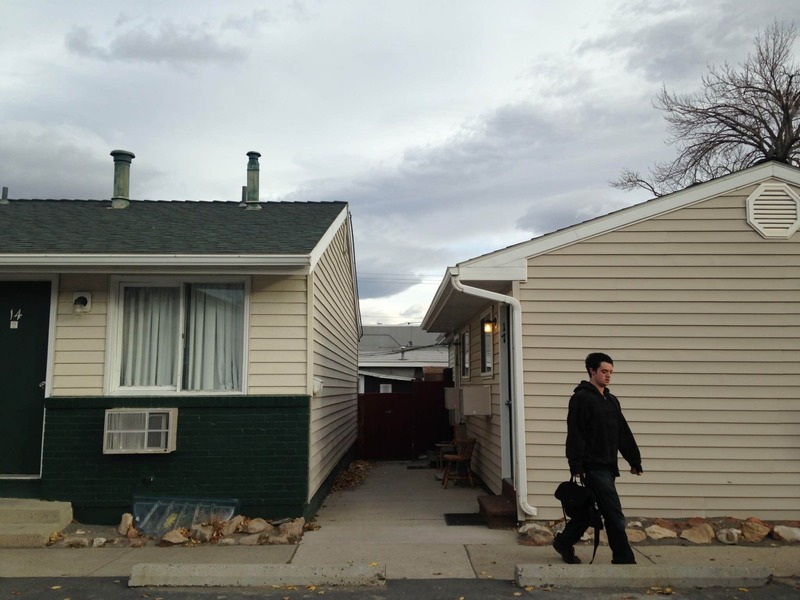 Our goal was to get to Elko, Nevada for our last night on the road. These salt flats look like they should be in Africa, not the United States. It’s a densely packed salt pan that looks like white, crack sand. In some parts, all you can see for miles is white. We didn’t get to go deep into the flats, but we did visit the edge of them! We had to drive about an hour each way in the other direction of Elko, but it was totally worth it to see this famous site in person! Nevada is really boring – at least I-80. I sound dramatic, but you can go 75 miles without seeing a single house. After leaving Elko, it just all turned to a lot of nothing and literally so many tumbleweeds! I remember driving past a prison in the middle of nowhere and thinking about how depressing that prison must be. 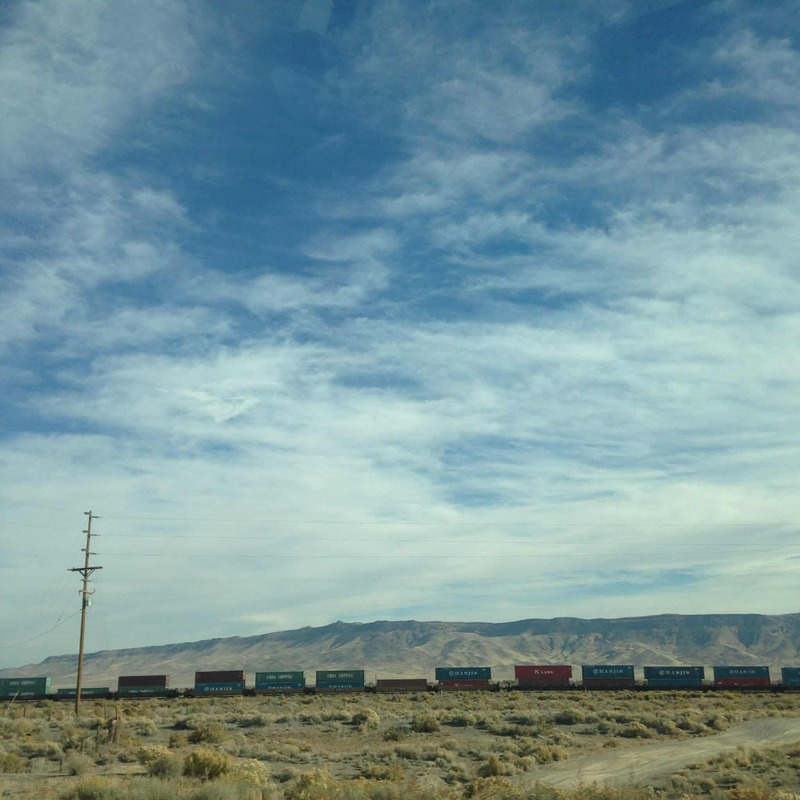 We did pass a long train, once, which was cool. And I enjoyed that every gas station had slot machine in them. But settle in for a day of boring scenery, high winds and not a lot of civilization. You’ll be tempted to speed since the roads are so long and flat – kepe in mind that the cops are really good at hiding in ditches and behind rocks here. We didn’t get pulled over, but I saw them hiding a few times. Avoid that ticket, girl! Our original plan was to make a stop in Reno to drive downtown and play a few slots. But, it was pouring rain as we entered Reno. I was also worried about someone breaking into our car and stealing our belongings as we were in a casino. So, we drove right on through. But, we like Reno. We visited a few years ago (read my travel guide here) and you should make a point to visit. Yes, they have a gambling scene, but it’s also a hipster town with cute stores and small coffee shops. 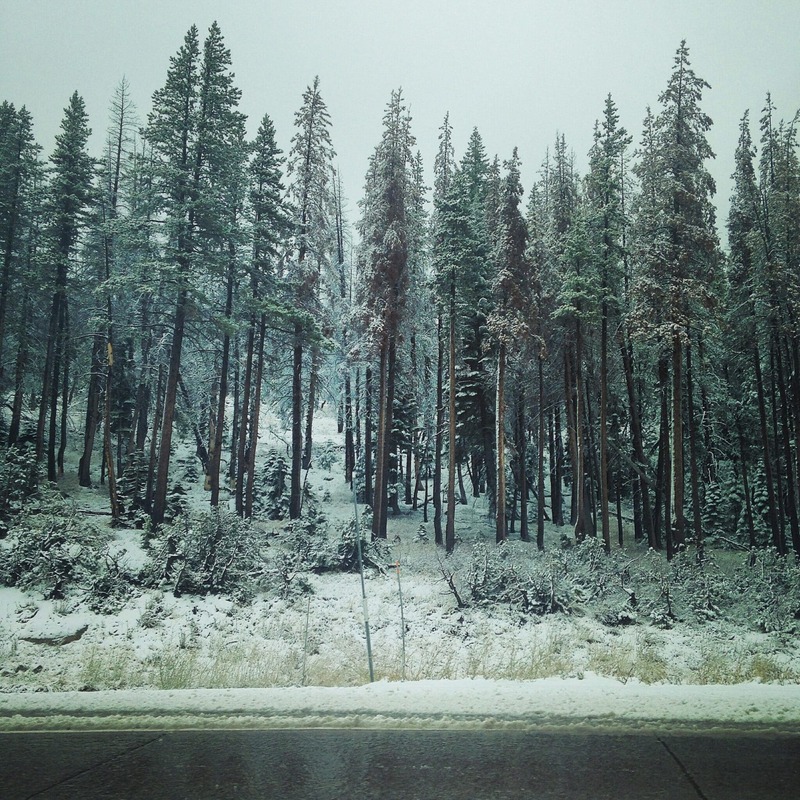 If you are taking a road trip across America and plan on driving through the Sierras in the winter, you NEED to have snow tires and chains in your car. We probably should have been driving with them due to the snow, but we had no idea. Chains are not only sometimes required by law, but you will get stuck on the mountain if you don’t have them. The mountains were stunning. They always are in the winter (and summer, too, let’s be honest!) After coming out of the mountains, the weather quickly cleared into a warm, sunny day. We saw palm trees as we passed Sacramento and we cruised on down to the Bay Area. After 7 days of driving, we were at our new home. If you were wondering how much a road trip across America costs, ours was about $1000 in total. We stayed at cheap hotels and ate at cheap restaurants. Our major costs was gas! But, your road trip can be what you want. 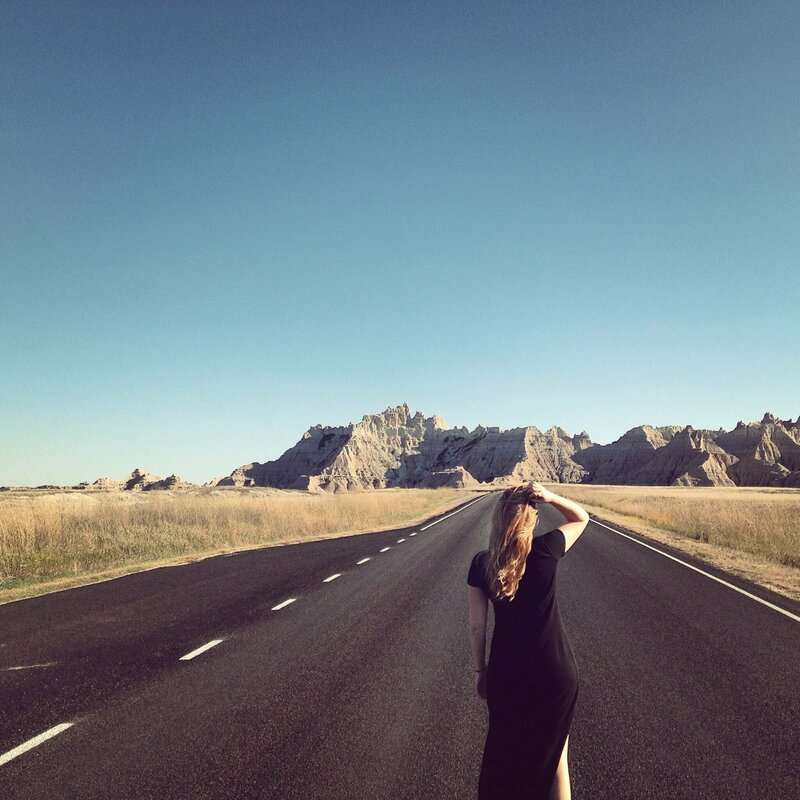 It can be route 66 road trip where you camp along the way, or an East Coast jaunt where you shack up in luxury hotels from New York City to Niagra Falls State Park. East Coast: Start in Maine for fresh seafood. See Acadia National Park and drive down to New York City, through New Jersey then to Washington D.C. Swing inwards to drive through the historVirginiaina and Shenandoah National Park. Soak in the beauty of the Smoky Mountains National Park. See Atlanta and keep driving to Florida, or cutting it short at South Carolina or North Carolina. Well, that’s our story! That’s why we moved to San Francisco and the exact route we took across the country. This road trip across America made me really fall in love with the USA. I love traveling abroad, but it took a long drive across my home country to fall in love with it. I can’t wait to do more road trips – hopefully some with Twyla! If you have any questions about our trip or any road trip tips, send me a DM on Instagram @thewhimsysoul and I’ll be happy to help! What brought each if you to the Bay? Love your post and travel adventures. I follow you on Twitter ( I’m @nich512) and on Instagram (I’m @buggypoo2), please follow me on Insta.